The Commuter Rail System connecting Bengaluru city to the suburbs will soon become a reality with South Western Railway (SWR) expanding its network to the suburbs. Rail India Technical and Economic Services (RITES) has submitted a feasibility report to the State Government. It is said that suburban trains could start 15 months from the date of approval given by the Government. The Suburban Commuter Rail System will connect high-density locations like Whitefield, Kengeri, Tumkur, Dodaballapur and Chikkaballapur (near Bangalore International Airport). The proposal for a commuter rail system has been pending for some time and was awaiting a feasibility report by a professional organisation. “RITES submitted a report to the State Government almost a month back. Railways, Directorate of Urban Land Transport (DULT) and related organisations had a meeting two days ago to discuss the report. The report will be resubmitted in three weeks time to the State Government with some modifications as discussed in the meeting. We are hoping that the project could happen now as we have a framework for the project,” said the Divisional Railway Manager of South Western Railway (SWR) Division, S. Mani. The project will not require new tracks as the existing track network will serve the purpose. However, in Phase-2 of the project, doubling of all lines will take place and electrification of lines may also happen. “We will have to decide on the funding structure for the project and we will have to see the monetary commitment for the project also,” said Mr. Mani. Bangalore City Railway station will soon be expanded. A report submitted by RITES proposed two additional platforms by shifting the cleaning and maintenance units to another station like Byapanahalli. Initially it was proposed that the Binny Mill land would be used for the expansion of the City Railway Station which sees 2 lakh passengers every day. The station needs to be expanded because the number of long distance trains has increased. Mr Mani said that a huge space between platform numbers 4 and 5 is being used for cleaning and maintenance of coaches which will be shifted to Byapanahalli where there is land or to Hejjala railway station located close to Ramanagaram. “Once the unit is shifted, the space can be used for constructing two more platforms at the station and more long distance trains can then take off from the City Railway station,” said the DRM In the report submitted to the State Government, the Railways has requested that the Binny Mill land be developed as a commuter rail hub for passengers to quickly board and alight from trains. “We will be spending close to Rs 13 crore on maintaining the rakes at the station. 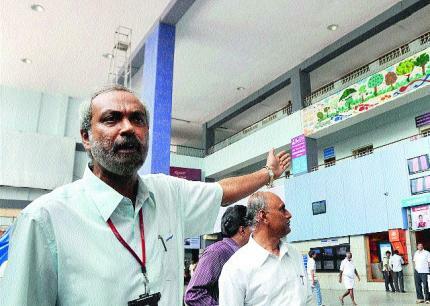 There was a proposal to revamp Byapanahalli station and make it into a world class station but that is not under our purview as it lies with the Railway Board.,” Mr Mani said. A new building is also being built, with parking space, restaurants and reservation counters. BMRCL stations will be connected to railway stations with the help of travelators. Railways have entered into an agreement with BMRCL to provide this facility to connect MG Colony metro station (entry/ exit points) with Bangalore City Railway station. Railways have agreed to provide land for this facility. The travelators will be overhead. It has also been proposed that the railway station’s subway be connected to the metro station. Railway passengers could soon take a bus from the railway station itself. Railways in collaboration with BMTC are planning to have a bus lane right outside the station. Another possibility is the new road from the railway station that connects to the Koday Circle. This road is being widened and BMTC buses may come from this road to the railway station. All illegal entry points at the City Railway station will be closed, and 100 CCTVs will be installed at the station. The station will be equipped with two baggage scanners and two vehicle scanners. Close to Rs 2 crore will be spent on enhancing security.